Here's a fun piece of trivia: Back when they were getting ready to make Die Hard 4, one of the possible story ideas was referred to as Die Hard 24/7, a crossover film where Bruce Willis' John McClane would partner with Kiefer Sutherland's Jack Bauer. 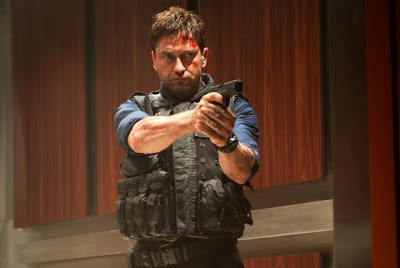 While such an idea would be too awesome to feasibly exist on-screen (though I wouldn't rule out a comic book), I was reminded repeatedly of the idea watching Olympus Has Fallen. Take a shot when you see something explode and/or catch fire. Directed by Antoine Fuqua, who you may remember from Training Day-- Okay, stop. Yes, he directed Training Day. In 2001. In recent years he's directed both Shooter and Brooklyn's Finest. In fact, he also directed The Replacement Killers and Bait, all of which I thoroughly enjoyed. And while Training Day is his highest-grossing and most recognizable film to date, I just think it doesn't bode well that the poster has to reference a movie made 12 years ago. 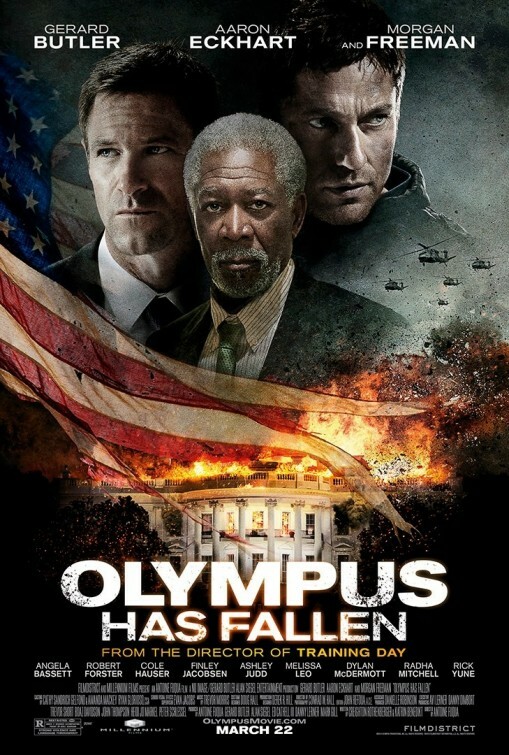 Just say "Directed by Antoine Fuqua", I'd think he's got enough on his resume for his name to stand on it's own. Anyway, the film opens with President Asher (Aaron Eckhart) boxing with his bodyguard Mike Banning (Gerard Butler). 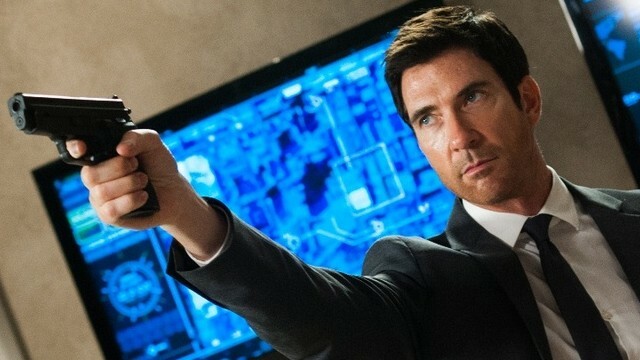 It's a bit of friendly sparring that sets up the friendship between our principal characters, interrupted by another Secret Service agent, Forbes (Dylan McDermott), who is cast in shadow and silhouette to indicate he's a bit shady. Symbolism! Asher and his family are on vacation at Camp David and are getting ready to return to the White House. Banning chats up the First Lady along with their son Connor, who we see playing Uncharted 3 on the PS3. It's surprisingly uncomfortable to realize that you're watching a child playing a T-rated video game where an American guns down waves of enemies in a middle-Eastern setting, in an R-rated movie where an American guns down waves of enemies from North Korea. 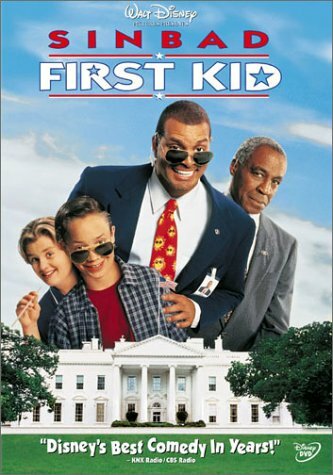 A tragic backstory ensues shortly where a car accident results in the death of the First Lady, with Banning unable to save her. It probably would've had more weight if wasn't the first thing we'd seen in every trailer for this movie. Eighteen months later and Banning is still living with the guilt of his failure, no longer assigned to protect the President, but I'm at a loss to tell you what his job is now. It's an important day at the White House, with the South Korean Prime Minister and his delegation arriving to discuss the escalating conflict with North Korea. Notable among the delegation is Head of Security Forbes-- Wait, what? "South Korea really is a lovely country. Have you seen their subway trains?" So this guy left the Secret Service and got a job with the South Korean government running security? Does that actually happen? This is an odd move, and as it turns out, totally pointless. So, as the delegation makes it way into the White House, a huge gunship flies into DC and shoots down the Air Force attempting to force it to land. You would think it would be a little harder to fly a gunship to Washington, considering it would have to cross a fair amount of land first. If it's coming straight from North Korea, it would cross most of the continent. If it's coming the other way, it still has to clear New Jersey and Delaware. And if it was stolen elsewhere, how does a gunship go missing and nobody notices? But let's put aside the logical inconsistencies. So the Gunship arrives over Washington and immediately begins firing gatling guns on the White House-- no, wait, first they stop to hose bullets on the civilian areas around the White House. Strategic? Maybe if you want to cause general panic among the populace, but I think they've got that covered with the rest of the plan. Secret Service is immediately scrambled to deal with the threat and the President is ushered into a bunker, with the South Korean delegation taken along. The White House has surface-to-air missile launchers which are brought out to use against the aircraft... but the plane deploys flares which easily divert the missiles. Now we get to see who wins in a fight between a dozen guys with rifles and an AC-130. The 2013 Secret Service Pock-N-Lockathon was poorly received. So much for that. Next we get a bus full of tourists who set off bombs to blow a hole in the gate (why did they have to be suicide bombers?) and storm the front lawn. They're backed up by a pair of armored garbage trucks that have been modified with heavy machine guns to mow down the defense. Dozens and dozens of highly trained guards literally walk into a meat grinder, for several minutes. Meanwhile, Banning has been trailing behind the invading force and picking them off with his handgun, actually scoring a headshot against a sniper at long-range to establish that Banning has superhuman marksmanship skill. Despite arriving to the White House after the invaders, Banning enters the White House ahead of them and takes up a position inside. The South Korean delegation inside the bunker then takes out weapons and instantly eliminates the President's personal security detail. We also see that Forbes is allied with the terrorists, which would have been a big reveal if it hadn't been telegraphed three times prior. He's cast in shadow when we first see him, he expresses a desire to take the easy job when he stays behind at Camp David in the prologue, and when we see him next he's taken up a private security job for the South Korean government. Antoine Fuqua does action like a master, but subtle he isn't. Anyway, the President and his cabinet are taken hostage. 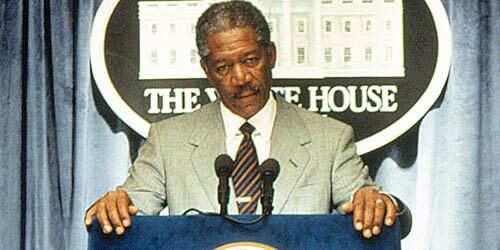 Terrorist leader Kang (Rick Yune) contacts the Speaker of the House and Acting President Trumbull (Morgan Freeman) to issues his demands for the US to pull their military forces out of Korea to allow their civil war to continue. I could see someone starting a war over this movie. It turns out that the real goal of the terrorists is to gain access to a secret nuclear failsafe program called Cerberus, which is used to prematurely detonate nuclear missiles in flight before they reach their intended targets. 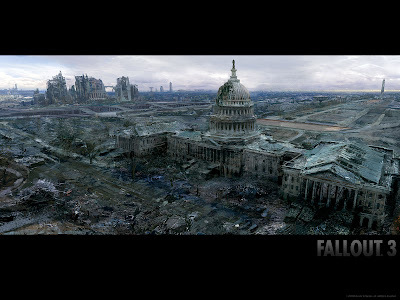 With three access codes from the President, Vice President, and Secretary of Defense, Kang can detonate the missiles inside their own silos, and turn America into Fallout 3. It's worth pointing out that, were this a real thing, it would only detonate the missiles themselves, not the nuclear payload, so at worst we'd be looking at a bunch of damaged and irradiated missile silos, not a nationwide holocaust. But for a big looming threat, it's effective. Kang plans to torture the cabinet members into giving up their failsafe codes, which really just highlights the problem with having all three VIPs in the same place, but that's another logic issue. Kang successfully extracts the codes from the Vice President and Secretary of Defense, not because they broke under torture, but because President Asher can't bear to see it and orders them both to comply. Now, I can accept that it's a hard thing to watch (especially the Secretary, who takes a seriously brutal beating and is arguably the most heroic figure in the movie), but giving up the codes means the deaths of millions of people. In fact, keeping the codes is the only thing that guarantees your survival, since they can't get your code if you're dead. But we have to move the plot along, so Asher folds like a napkin. He asserts that even if Kang gets the other codes, he won't submit his own, but we've already established his low threshold for violence, so I doubt he'll be a stone wall of resistance. In fact, Kang's men are actively searching for Connor to use as a bargaining chip. Banning finds Connor hiding in one of the false walls of the White House (which I would have to assume can also be monitored, because the Secret Service would never allow a blind spot in their security), and manages to sneak him outside to safety. Soon after, Banning encounters Forbes alone and uncovers his betrayal, leading to a quick fight that leaves Forbes dying from a throat wound. Banning encourages Forbes to tell Kang that Banning is dead, to give him an advantage. Forbes does so, and Banning rewards him with a knife through the skull. Granted, the punishment for treason is death, but that's cold, bro. Is it a production photo, or the 1:16 scale action figure? We also get treated to a scene where Banning captures a pair of terrorists and interrogates them for information. Specifically, he shoves a knife up through the jaw of the first terrorist, then stabs the knee of the second. This is where that 24 influence shows itself, where the hero does deplorable things in the name of justice and still manages to maintain his hero status. The audience is meant to side with Banning in whatever he does, because the bad guys are so absolutely evil that anything done to them is acceptable. It's the Nazi villain principle, and we've seen it applied over the years to whatever major threat the Western world is facing at the time. From the Germans to the Russians to the Chinese to the Iranians and so on and so forth. It makes for easy screenwriting because it reduces the antagonists to cartoon status. He might as well be fighting Cobra Commander. Another obligatory scene occurs when the big military general sends in a team of Navy SEALs via helicopter, despite Banning's warning that he needs to recon the area first. Turns out that the Terrorists brought a state-of-the-art computerized anti-aircraft gun to repel the helicopters. They're ripped apart just before Banning can disable the gun and he's knocked through two floors of the building as a result. This scene adds little to the movie, but it must exist so that we can have the inevitable follow-up where Banning berates the general for his bad decision. If this is Die Hard, then the general is Deputy Robertson, the unreasonable authority figure with no actual authority in the situation, who only exists to look bad so the heroes look good by comparison. 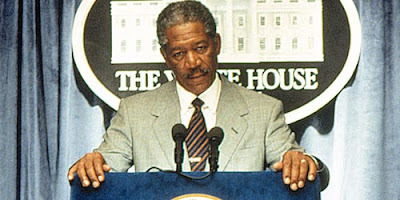 It also results in a shouting match between the general and Speaker Trumbull, which is the only time throughout the movie where Morgan Freeman gets to actually act. He's wasted in this movie by being stuck in a chair, making no major impact on the plot, and his biggest scene is completely unintelligible. Talk to him again when a comet is about to hit the planet, he's good with those. "We believe the comet to be allied with North Korea." It turns out that the Cerberus system is unbelievably easy to circumvent, as Kang's computer specialist manages to brute force hack her way into breaking Asher's code. Everyone is stunned because apparently it would take days to break all three codes, but only a couple hours to break Asher's. Maybe my math is wrong, but if only takes a couple hours for one code, you could still break all three codes in one night. It seems like the writer kept putting himself in a corner and had to improvise a way out, causing dozens of logical inconsistencies. Skipping to the end, Banning contacts Kang directly on video (how, why, who cares...) and taunts him a little, throwing in a dig where he threatens to stab Kang in the brain, take a picture, and leak it to the press because people like Kang enjoy that sort of thing. Read that again, I'll wait here. This is our hero, ladies and gentlemen. He's not just doing this because he has to, because it's his duty, because he's saving lives. He's enjoying the violence, and that's a super scary thing to realize. We're supposed to sympathize with Banning for trying to redeem himself from his past failure, but that's almost never touched upon. Jack Bauer had very serious moments where he had to come to terms with the horrible acts he committed in the name of saving lives. John McClane blows away bad guys left and right, but even he had human moments when he laments the sour side of being an action hero. I'm all for Gerard Butler coming back to action movies after his extended string of romantic comedies, but he needs better than this. More 300, less Gamer. 1) Why would Cerberus come with a countdown timer? If it's purpose is to disarm missiles in-flight, wouldn't you want it to be an instant activation? 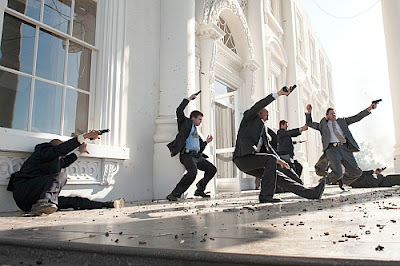 Remember the end of Mission: Impossible 4? 3) America is about to become an uninhabitable nuclear wasteland. How are you planning to get out of the country when you're in the middle of a radioactive hot zone? And even if you do, dragging Asher along the way, who's going to pay to get him back? And why is Kang doing all this? Is he that dedicated to North Korean ideals that he's willing to murder millions? No, it's because his mom stepped on an American landmine. Yeah, that's proportionate. He could have been the Hans Gruber of the movie, but his character motivations boil down to Chaotic Evil. The best way to write a villain is to remember that there are no absolutes. Nobody is the bad guy in their own mind, and nobody exists purely as a device in someone else's story. What does Kang see as a perfect outcome for his plan? Does he know the men under his command? Does he have a family? The movie doesn't attempt to answer any of these questions, because that would humanize the villain, and if you do that, it's a lot harder to cheer when he gets a knife in the brain. And that brings me to the final question this movie gave me: Should we be cheering at all? Are we so bloodthirsty? This isn't purely an American value debate, since I also heard cheers in my Canadian audience. It'll be interesting to see how this movie plays overseas, where nationalism and sensationalism aren't as pervasive as they are in Western culture. Even if this guy is the Asian Hitler, should we be foaming at the mouth to watch him die? What does that make us? If you're the kind of person who asks these kinds of questions, this movie will make you very uncomfortable. When they talk about the kind of movie where you have to turn your brain off, this is what they mean. As an action film, it's badass. I enjoy gunfights and explosions and a big meaty punch whenever I can get it. But when you put a flag in the frame, you make a statement, whether you mean to or not. America, this isn't you. I can't believe you read it at all, thank you for checking it out!